Nestlé, Tim Hortons, PepsiCo., Coca-Cola, McDonald's... Let’s turn the tide on plastic pollution by calling on these five corporations to move away from single-use plastic! Plastic pollution is literally everywhere. From rivers to the deepest point of the ocean, from the Arctic to the Antarctic, and from whale stomachs to aquatic insects. And according to recent news reports that stated a 40% rise in plastic production in the next decade, the situation is going to get much worse. 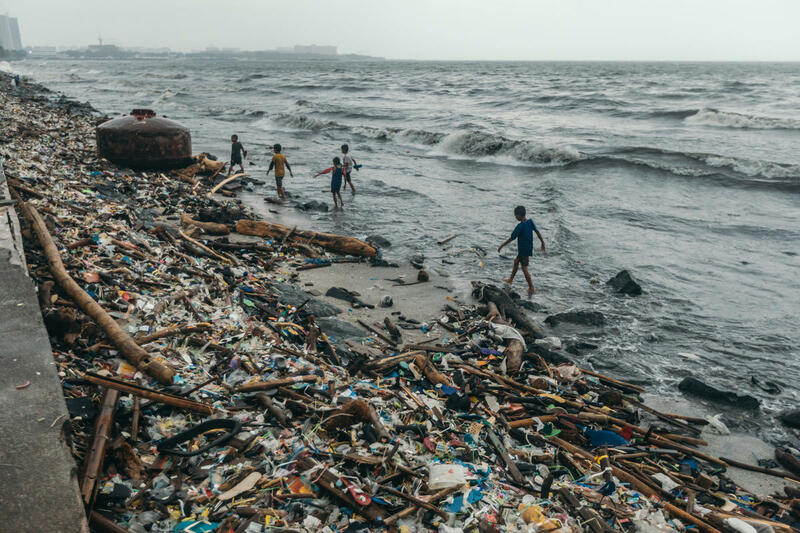 Mounds of plastic trash are carried away into the shores of Manila Bay by monsoon and Typhoon Yagi (local name Karding). These past months, Greenpeace and its allies from the Break Free From Plastic movement have led 239 brand audit activities on six continents in an effort to draw the most comprehensive global snapshot of the worst plastic polluting companies. Unless we take action. Thousands of volunteers logged hundreds of hours sifting, sorting, and counting plastic packaging collected from beaches and rivers in Canada and around the world. And today, we’re releasing the results. It’s time to name and shame the companies that are trashing our waterways, oceans, green spaces and communities with their throwaway plastic. According to what we found in the five brand audits held in Canada, Nestlé, Tim Hortons, PepsiCo., The Coca-Cola Company, and McDonald’s Corporation were the most frequent multinational brands collected in cleanups, in that order. Globally, three of the same companies made the top 5, with The Coca-Cola Company named as the top polluter, followed by PepsiCo., Nestlé, Danone, and Mondelez International. The Coca-Cola Company, PepsiCo, and Nestlé (in this order) accounted for 64% of the branded plastic trash that was identified across North America. 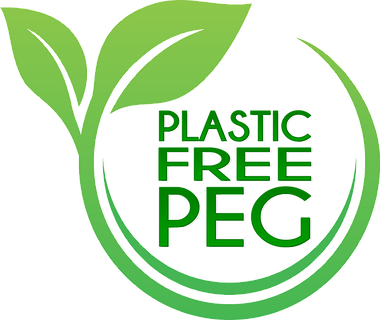 Their brands’ contribution to plastic pollution is alarming, but unsurprising given the billions of single-use plastic packaged products they churn out yearly. Pop and water bottles, rogue bottle caps, Lay’s chip bags, Kit Kat and Coffee Crisp bar wrappers; chances are that any cleanup conducted will reveal plastic pollution associated with these companies. And then there is Tim Hortons with its infamous throwaway coffee cups. In my own experience, it’s impossible to count the number of Timmy Ho coffee cups or lids I have seen or picked up along a highway, in a park, on a beach or along a river. So it’s no wonder that the prevalence of these cups at our cleanup and audit locations landed this company in the second top polluter spot in Canada. I wonder what Sidney Crosby and other hockey players think about their face being on those cups now? Plastic lined coffee and other beverage cups were the third most common type of plastic item found, with Tim Hortons, McDonald’s and Starbucks being the main contributors. The second most frequently found item was plastic bottles, with Nestle, Coca-Cola and PepsiCo. water and beverage brands contributing the most to these numbers. And the top plastic item found? Food wrappers. Those colourful, often foil lined chocolate bar, chip bag, granola bar, candy packaging that so many products come in these days. Nestle and PepsiCo. 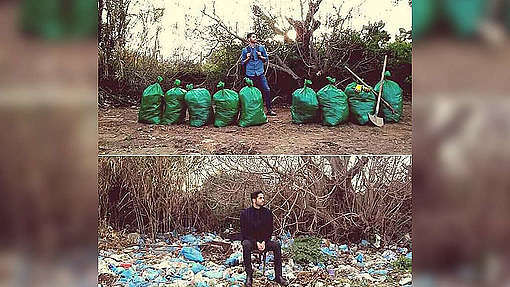 were big contributors to this category; however, branded trash by numerous other companies was also identified. Around the globe, 239 cleanups and brand audits, in 42 countries, on 5 continents contributed to the results. In Canada, we did 5 audits in partnership with Ecology Action Centre in Halifax; Surfrider Vancouver in Vancouver; Strawless Toronto, Don’t Mess with the Don, and Stop Plastics in Toronto; and Mission 10 Tonnes in Montreal. Surfrider Pacific Rim also conducted one in Tofino, B.C. Across the 5 Canada locations, we collected 2231 pieces of identifiable trash and over 700 pieces of branded but unidentifiable trash due to degradation. 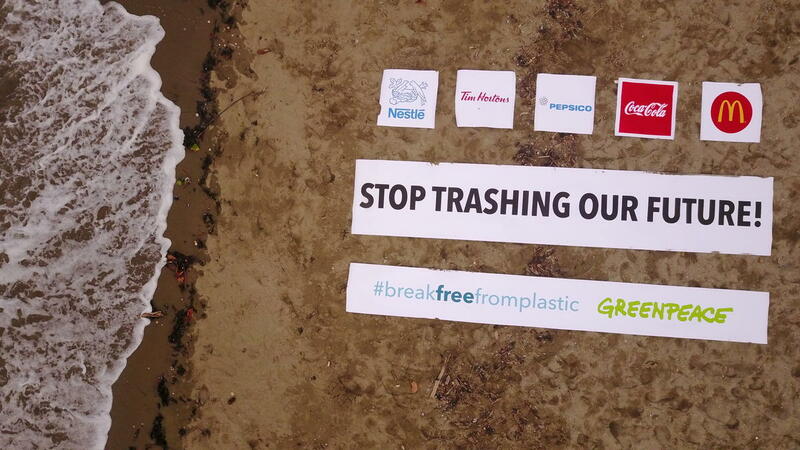 A large number of other well-known companies in addition to the top 5 polluters contributed to the identifiable plastic trash found in Canada, including Starbucks, The Hershey Company (eg. Jolly Ranchers, Reese brands), Loblaw Companies Ltd. (PC, no name brands), Danone (eg. Danone, Evian, Naya Water brands), Costco Wholesale Corporation (Kirkland), Metro Inc. (Selection), and various others. The top 5 plastic polluters identified through 5 Canadian brand audit events are named through an aerial banner shot at Kitsilano Beach in Vancouver, British Columbia, where one of the audits was conducted. The banner reads “Stop trashing our future!” and shows the logos of Nestle, Tim Hortons, PepsiCo, Coca Cola and McDonalds. But even though all those companies played a role in trashing our brand audit locations, of the 2231 pieces, 46% was produced by the top 5 polluters. That’s why we’ve launched a petition calling on the CEOs of Nestlé, Tim Hortons, PepsiCo., The Coca-Cola Company and McDonald’s take responsibility for their role in the plastic pollution crisis, to stop trashing our future and to commit to phasing out single-use plastic products. Sign the petition now and join us in pushing for a plastic-free future. A legal framework must be put in place to sew at least the top ten polluters! Why are they allowed to continue? Base the fines on audits! Huge fines! A lot at stake! Use the PPP (Polluter Pay Principle) for establishing a legal framework to sew the top ten polluters! Work to do it on a worldwide basis! There should be a global entity to stop global pollution! We are lagging behind! As a member of Bluedot, a grassroots initiative of the David Suzuki Fdn., my team and I continually clean up the waterfront beaches of Toronto East mostly around the Rouge River area. 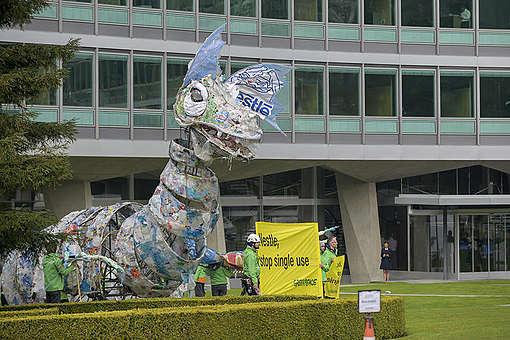 I totally agree with the findings of Greenpeace having sorted out the garbage many times, that the polluting culprits are the same as their results show especially Nestle plastic water bottles ! Thank you Greenpeace for this important audit. The new "R" is Refuse! If even a small percentage of us stopped supporting these companies by not buying their products we could make a huge impact forcing them to change! It’s up to each and everyone of us.we, the people, have the power to change this. When you buy something read labels to see who produced the product! Look on the internet to see what subsidiary companies these huge conglomerate companies hold and don’t buy it. The other part of the equation is; people are too lazy to recycle the plastic bottles, paper cups, etc. It's easier to throw it in the trash than recycle. If there was a significant recycling fee put on theses products when purchased, maybe more people would take the initiative to recycle.